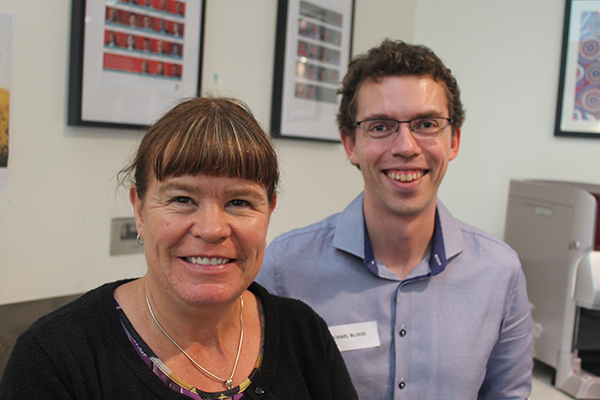 Townsville Hospital Emergency Department Pharmacist Kirsty Sibley and Caboolture Hospital Emergency Department Pharmacist Michael Blood at the Caboolture Hospital Frailty Workshop recently. Elderly patients are spending less time in the Emergency Department under new models of care developed by the Caboolture Hospital. Caboolture Hospital Acting Executive Director Dr Simon Bugden said speed of care was crucial for older people arriving at the Emergency Department, as they could spend considerable time in hospital, particularly in the last few years of their lives. “We identiy frail patients as soon as they enter the ED and ensure they have a comprehensive assessment and receive a frailty score that helps us identify potential health concerns quickly and identify patients requiring urgent attention,” Dr Bugden said. “Having dedicated frailty staff in the ED including a pharmacist and Allied Health specialists who can act quickly to ensure a short stay, rather than admitting them to a ward, has considerably reduced the time in hospital and improved the recovery time for this group of patients. “As many as 600 patients over the age of 75 present to the Caboolture Hospital Emergency Department each month, however under these new intitives we can ensure a more consistant and faster approach to their care,” he said. The team is hopeful that following the improved care for frail elderly patients at Caboolture, the hospital’s inititavies will be replicated at others across Queensland and potentially interstate. “We’re also determined to reduce preventable Emergency Department presentations from residential aged care facility (RACF) residents,” Dr Bugden said. “We have three staff working in our Rapid Aged Care Assessment and Referral (RADAR) team, who assist RACF staff who are caring for deteriorating or acutely unwell patients,” he said. “They provide care and assistance to RACF over the phone or visit the facility to provide personalised care. “We’re also working in conjunction with University of the Sunshine Coast researchers on a project to investigate the decision-making processes by RACF nurses when deciding whether to transfer residents to the ED, with the aim of reducing the number of unnecessary transfers. Caboolture Hospital one of three hospitals to receive Queensland Health funding to develop and trial initiatives to improve the medical journey for frail patients.